The MSAR is a helpful tool that the AAMC offers premed students. Too many students use it in the wrong way, though. How should you use it? We’ll talk about that today. [00:21] What Is the MSAR? The MSAR (Medical School Admissions Requirements) used to be a book. Now it is now a website. And the site’s user interface is much better now than it was initially. Produced by the AAMC every year, they provide updated data from all the allopathic U.S. medical schools. So they go to medical schools and gather the information, which is then given to the AAMC to put on the MSAR website. It costs around $25-$30 for one year of access to it. Just as a side note, the MSAR equivalent for osteopathic (DO) medical schools is called the CIB (College Information Book). Most of what I’m saying today also applies to the CIB. The MSAR will allow you to look at each medical school and really compare the schools. You can see what classes are required for each of the schools. You can check whether that medical school allows you to take online classes for your prereqs or not. It gives a breakdown of students interviewed and where they’re from or whether they’re international. Here’s one thing to keep in mind when you’re looking at the MSAR and using it to decide whether or not to apply to a medical school. The MSAR looks at historic data (last year’s class or the year before). So it doesn’t actually tell you anything about what the medical school is looking for now. The MSAR can’t tell you whether or not you should apply to a school. Unless you are completely missing prereqs required or you don’t fit with the mission of the school, the MSAR shouldn’t be your basis for which school to apply to. A lot of premed students look at the MCAT and GPA data in the MSAR for each school. You will see median MCAT and median GPA. Many students look at that to determine whether or not they’re going to apply to the school. All that score tells you is that half of the class is above it and the other half is below it. That’s all it tells you. If a school’s median MCAT score is 510 and you scored a 505, does that mean you shouldn’t apply to a medical school? Absolutely not. It only tells you that half of last year’s class was below 510. It also has percentile ranges like 25th to 75th and 10th to 90th percentile. Those are better ones to look at to give you a better idea. Specifically, look the 10th percentile number. But if that is a 505 and you have a 502, that still doesn’t mean you shouldn’t apply to that medical school. It just tells you that 10% of the class is below that number. 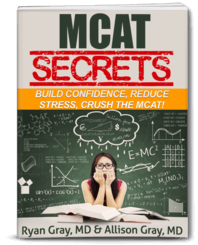 What the MSAR doesn’t tell you is what else students have in their application that allowed them to be accepted to the medical school with an MCAT score in the bottom 10% of the class. Again, the MCAT and GPA are just two parts of your application. Your application consists of so much more. Even the highest MCAT and GPA cannot guarantee you an acceptance to medical school. Your scores can open doors, but it’s the personal statement, the rest of your application, and your interview that will get you an acceptance. When you look at MCAT and GPA for a school, that should not ever dictate whether or not you apply to that medical school. It’s just data. It’s not telling you who those students are. The MSAR can tell you stuff about the curriculum and the school’s mission statement. They provide what kind of students they’re looking for. They have the breakdown of the types of students they’ve accepted in the past. Again, this is historical data that doesn’t necessarily tell you what they’re looking for. Therefore, the MSAR should not dictate what schools you’re applying to. But they’re there to help give you some more information. As you’re gathering information, the MSAR will help you figure out what schools are out there. Also, take note that even if a school says for the MSAR that they don’t accept online classes, you can still call the school and present your situation to them. Sometimes, they’ll say yes. Other times, no. So look at those specific requirements on the MSAR. But other than that, it’s just historical data. It shouldn’t dictate where you apply to medical school. Related episode: How to Choose a Medical School and Put Together a School List. Related episode: Your MCAT & GPA Don’t Matter as Much as You Think. ← Should I Talk About Being Respected as a Physician?